H x W: 18.5 in. / 29.5 in. The battle of Five Forks ushered in the final moments of the nearly ten-month-long siege of Petersburg. By April 1865, the only major supply route open to Robert E. Lee's army was the Southside Railroad. Union General Ulysses S. Grant saw an opportunity to cut that rail line and compel Lee to abandon his Petersburg defenses. To accomplish this, Grant ordered his General Philip Sheridan, well-known for his aggressive warfare tactics, to take a combined force of infantry and cavalry and attack the thinly held right end of the Confederate line. On the afternoon of April 1, roughly 17,000 Federal troops under General Sheridan collided with 10,000 Confederates commanded by generals George E. Pickett and W. H. F. "Rooney" Lee. 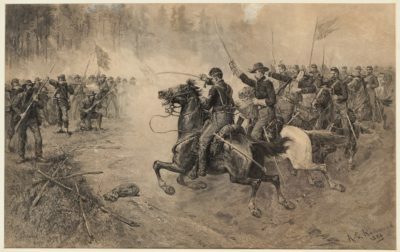 The fighting ended after three hours, when the Union troops successfully overwhelmed both flanks of the southern line, which was centered on a crossroads called Five Forks. Sheridan's losses numbered approximately 800 men, while Pickett lost 3,000, most of whom were captured in the fight. Lee's last major supply route had been broken. The next day, after mounting an all-out assault against the remaining Confederate positions around Petersburg, Sheridan’s victorious army began a march that would end at the small village of Appomattox Court House.